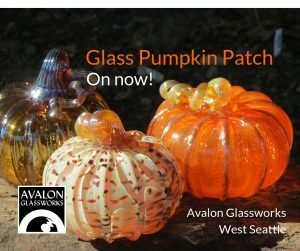 Come pick your glass pumpkins! They are hot all month with hundreds of blown glass pumpkins, gourds, fruits and vegetables for you to pick. Prices are $20-$95 each. Traditional orange to purple, you’ll find all colors and styles. Curly stems, straight stems, tiny pumpkins, large pumpkins, many have accents of gold on the ribs. Create a Thanksgiving centerpiece with several sizes! Visit our West Seattle studio at 2914 SW Avalon Way, Seattle, WA 98126, to select yours, or shop online here. We are open daily and you can often watch us blow glass when you visit.